Studies have shown that plants in the office can help lower workplace stress and enhance productivity, as well as naturally improving air quality by absorbing pollutants and dust from the air. In light of what’s going on at the company I work for (more on this later), I thought it was a positive step by the company to try to improve our well-being by deciding that free plants would be given to employees (who wanted them), sourced from a local garden centre. The company hadn’t counted on how popular this would be (although they should know by now that anything ‘free’ is always going to go down well!) so had to arrange for a second delivery, when all the plants from the first delivery were snapped up in a Black-Friday-Sale-like frenzy! Around 100 plants of various varieties are now dotted around the office and it all looks very nice and pleasing to the eye! Some people have given their plants names – since I don’t have very green fingers, I’ve decided not to bother, haha! Time will tell whether this new environment will help improve the ambiance around the workplace. Following on from the original announcement back in April about our business being sold by its parent company, there have been lots of closed door meetings and various rumours flying around the web and the financial pages these past few months about potential buyers for the business. Anyway, there’s finally been some sort of update, although it looks like it will be a few months before anything changes due to the French employment unions (works councils) getting involved (the sale of our business will be as a European group as opposed to just the UK businesses). Still no real point in worrying as I don’t know how things will turn out. The general feeling in our office is still quite upbeat, business is good, there’s still a buzz about the place. However, I heard that some people in the London and Bristol offices have called in ‘sick’ since this latest announcement a few weeks back – how to make things worse than they actually are, especially for their colleagues…. Anyway, my quest for FI/early retirement shall continue unabated until something drastic happens and I need to adjust my plan – yes, ‘adjust’ because I have no intention of abandoning it! However, it looks like we may be in need of some more plants in the office very soon! Or very strong alcohol, as someone suggested at the all employees’ meeting, haha! This entry was posted in Well-being, Work by weenie. Bookmark the permalink. I know from experience that it does make a difference to have greenery in the room. Oddly, though, I do not have anything in here. I will have to rectify that myself! Good luck with the progress at your company. It is a horrible position to be in. My FI journey is having to be adjusted a little at the moment for similar reasons. Not ideal, but there are worse things! Not so good about the uncertainty about the future though. The "not knowing" can be quite unsettling but cheerfully plodding on is definitely the best policy. Sorry to hear about the company takeover weenie. I've been through the same thing myself and it can become unsettling. Perhaps like you, I didn't spend too much time worrying about it as there's very little you can do about it. Calling in sick certainly won't help any decision (or their colleagues!). Great shout on the plants. Like D2, I think I need to up my game there too. Nice Triffid! 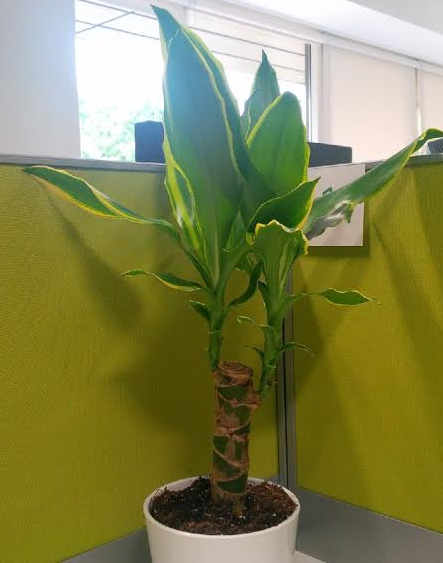 Plants existed in one of the offices I worked in. It did make a difference – plus "he" was given a name and a name plaque! He was called 'Pete the Pot Plant'. He was fed by the cleaner and people took it in turns to water and clean him and keep him happy. It was part of the 'down time' instead of getting a coffee we would gather and have a chat about Pete. It sounds odd but helped with team moral. 🙂 which given the current office situation can be a good thing. A company sale didn't derail my FI plans. If anything it made me more determined to save and escape the prison. I remember the closed door meetings with representatives from the respective bidders – then an exclusivity agreement while final talks took place. Good luck, I hope the winning bid is from a company interested in incorporating the business into its plans rather than taking the client book only. I am sure you will keep updating us on progress, hang in there and start formulating contingency plans. I really should bring in a plant or two for my work cubical to make it more lively. My wife has been bugging me to do that for a while now. I guess there's not much you can do with the work situation, wait and see what happens I guess. The plants have certainly brought some brightness to the place and 'life' amongst all the electronic stuff! Yes, there's nothing to do now except wait so I'll just keep on keeping on! Haha, I can see how 'Pete the Pot Plant' helped with team morale – that was a great idea! At the moment, people are quite proud of their plants and you can hear some giving others on how to look after them, watering etc. Good to hear that a company sale didn't mess up your FI plans and fingers crossed they're not just after our client book. Thanks for the kind words of support. Cheers and great quote from Twain – fingers crossed that's the case! I've not got very green fingers but I'm determined to look after this plant at work! Thanks for the kind words and see you soon! Our 'clear desk' policy means that when I leave the office in the evening, I'm only allowed to have my keyboard, mouse, monitors and telephone on my desk. And now my plant, which makes my desk look less….austere! Thanks for the kind words – as I mentioned above, I'll just keep on keeping on and see what happens. Christ… clear desk policy… That wouldn't fly at our place, mines a reet old mess! Cheers and hope it works out with the buyout stuff. Haha, not only do we have a clear desk policy but the 'desk police' (HR in disguise) actually do periodical checks to make sure it's enforced! So my desk is always tidy – my cupboard though? Best kept shut lol! Yes, you're really into your garden stuff now so you'll probably do a much better job keeping your plants alive! I've been trying to grow a chilli plant but it only produced one measly chilli – I must have done something wrong – would love to have them filling my windows! Thanks for stopping by, Mike.